Sony released the PSP Go on October 1, 2009 in the USA to much criticism and skepticism. The PSP Go is Sony’s first attempt at a pure digital distribution based handheld console. Prior PSP models used both Memory Stick and UMDs for game playing. The PSP Go forgoes the UMD drive for a smaller, sleeker slider design. It also adds Bluetooth connectivity, 16GB of onboard flash ram for games, photos, music, and comics and also sports an upgraded M2 memory card slot. The biggest shocker of all was the price, $250 US Dollars; the Go was more expensive than a Wii and only $50 less than a PS3 or XBOX 360 at the time of launch. As a previous PSP owner (original PSP-1001 owner), I plan to focus this review of the PSP Go like others have; I will give two reviews for owners new to the PSP platform and to do those who like me upgraded to the Go from a UMD based PSP. The PSP Go is noticeably smaller than the original PSP and the newer slim PSPs. It sports a slider design which in turn reduces the overall wideness of the device. The slider design also influences the moving of the analog nub and trigger designs. 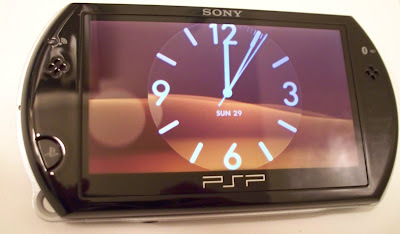 When closed, the PSP Go can either go to Standby mode or to the default Clock/Calendar standby screen. The display brightness, volume up and down, and audio buttons are located on the top of the GO, along w/the L and R Triggers. The PS Home button is located on the screen and is accessible when the Go is closed. The screen is also slightly smaller than previous PSP models but does seem a bit more vivid in colors. You can also output video in 480P to a compatible TV w/the optional AV connector cable. The right side has the power/standby/hold switch and the left side contains the M2 slot and Wifi on/off switch. The bottom contains the headphone/mic combo jack and also the data connector port. (PSP-1001 to PSP-3000 accessories and cables WILL NOT FIT since the connector has been redesigned. Speakers are now located on the front of it next to the screen and also has a built-in microphone on the bottom slider area. The device itself is solidly built with a gloss finish to it (adding to the list of devices that are magnets for fingerprints). It feels significantly smaller and lighter than the UMD based PSPs. I can definitely fit it into my pants pockets; it is just slightly thicker than an iPhone. Battery life is rated to be around 5 hours of game playing/video watching. Comparable to the PSP1000/2000/3000 series), however the battery in the PSP Go is non-removable and removing it will void your Sony warranty. This was mainly designed to thwart homebrew/hackers exploiting the battery/recovery menu hacks of the previous PSP models (ie Pandora battery). The new design/layout of the D-pad and the analog nub does not make gaming uncomfortable. It may take a few minutes to get used to if you were a previous PSP owner but overall is well laid out and comfortable. One feature that the PSP Go brings to the table is the ability to pause a game. Since games are loaded onto the PSP Go’s onboard 16GB of memory or a M2 card, one can basically hit the PS button and choose to Pause Game which will save the current game state into memory and allow you to exit back to your XMB on the Go and listen to music/surf the web/play another game/Locationfree TV. However if you try to pause another game, it will replace the previous pause state. Another new feature that the PSP Go introduces is the ability to sync a PS3 controller to it via Bluetooth and use it to play your PSP games with. This is handy if your using an AV cable to watch/game on your PSP on your TV. 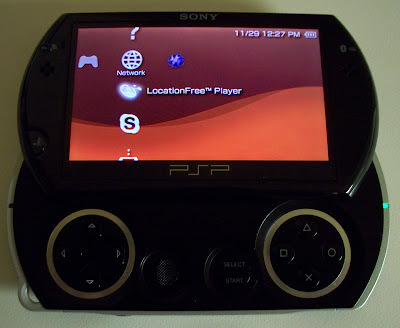 The PSP Go also lets you use the Bluetooth connectivity to tether a cellphone to and in turn use the cell phone’s data connection to play online or download games/music from the PSN store. You can also pair Bluetooth headsets and mics too. HOWEVER, the iPhone will not tether with the PSP Go due to the way it handles tethering, it uses DUN profiles vs PAN BT Profile(which the iPhone uses). however other smartphones that do support DUN profiles will work. One downfall of the Go is that to play games, the games have to be digitallly distributed. Game developers have not been very good about converting UMD versions to digital copies you can purchase from the PSN. Littlebigplanet PSP was not available on the PSN at the same time as the UMD release. This may be a big factor for those who are in need of playing new games the day they are released. Also, if you have a large UMD collection, it will not be transferable to your PSP Go; you will have to rebuy your games in digital format (in regards to the US PSP Go, EU has a transfer program and a few more promos to make it a bit more enticing). PSOne classics transfer fine and are rather enjoyable on the Go. They also support the game pause feature. You can transfer them via your PS3, PC or download directly on the PSP Go via the PSN store. Shortly before the PSP Go launch, Sony announced that it would be starting an ‘iTunes App Store’ clone/competitor on the PSP Go by allowing smaller, more casual based game development in the form of PSP Minis. These games would be cheaper (usually under the $10 mark) but still retain a higher quality of design/game play than most mobile games. So far there are over a dozen games varying; I’ve only purchased one, Blast Off and it seemed to be a pretty decent game for the price ($2.99). Sony did say that they would be allowing non-game Minis soon too, so hopefully we’ll see some widget based minis to spice up our Standby/Slider closed screens. The latest 6.2 firmware also brought a comic book reader to all PSPs. This will work in conjunction with Sony’s soon to be released online comic book store. The comic book reader allows one to download and buy comics and then read them on the PSP. The format of the comics are designed for the screen size of the PSP and the reader uses Autoflow features to advance the comic frame by frame by zooming and animating the window. The few sample comics were ok, some have complained that the zooming makes them dizzy but I have not had any problems with it. I defintely could see this becoming a very cool feature of the PSP and perhaps the first step on getting the comic book industry into the digital world. Some big names have already been signed onto sell their works including Marvel. Video and Music playback on the PSP Go is just as enjoyable as the PSP1000/2000/3000 series but can’t compete with a iPod or Zune player. The SensME channel is a nice add-on but does require one using the Media Go software to first analyze and then load the music onto the PSP. I will touch on the Media Go software later. SensME channel is designed to organize music based on tempo and mood (which is calculated via the Media Go software); there are energetic, daytime, mellow channels. The channel selections change as the day goes on too. Videos that are encoded to the PSP mp4 format look great. Pictures also do too, but the viewer is nothing to write home about. Its more of a bonus than anything. The LocationFree client works well if you have the appropriate base station. You can use wifi to connect or bluetooth with a tethered phone. Sony has updated the Media Go software for the new PSP Go. This software will let you sync music, photos, videos, podcasts, comics, and games/data to the PSP. It will also let you backup your games and saved data to your pc and let you reload/remove such data from the PSP and vice versa. It uses a Media Library to organize your music, videos and pictures and when you transfer items to your PSP, it will convert them to be PSP Format. NOTE! IF YOU CONVERT MOVIES TO MP4 format to view in high def, DO NOT ADD THEM TO YOUR MEDIA GO LIBRARY. I converted all 250 of my dvds to MP4 format using H264 codecs and in turn watch them on my PS3 and my Win7 MCE laptops. After I first installed the Media Go software, I naturally added my MP4 video folder to the library. I then went to transfer a movie to the PSP Go and started to realize that the Media Go software was actually RE-ENCODING MY mp4 files into super large, unplayable M4V files. Since the Media Go software and PSP can only read MP4 AVC files (non HD resolutions), it did not know what to do with the 720p mp4 files and went berzerk trying to Prep them. You can disable preparing of files if you go to Tools > Options > Devices and then go into the Preparation area. I would recommend NOT adding your library and instead re-encode manually your files to PSP formats. The PSP Go does do a ton of things right and quite a few wrong. I’ll touch on a few of the things I did not like or believe need to be changed. -PLEASE MAKE AN OPTION TO AUTOMATICALLY SAY YES TO THE “The Blueooth connection must be temporarily disabled. Do you want to disable it now?” of course i do! ARGG! very annoying. -Give me the ability to set what the L and R buttons do when the PSP Go is closed. I hate it when I’m watching a movie, listening to music with it closed and I just brush the L or R trigger and it skips to the next song or movie. Come on! Give me more options! -Make the PSP Go homescreen/closed screen more useful. When closed and on the XMB, let me use my L and R buttons to navigate! I hate opening up the PSP Go just to move around the XMB. Here’s what I’d like to see done: When the PSP Go is closed and on the XMB (not the clock), use L and R to navigate between sections (ie Network, Game, Video, Music, Photos). Then once I stop on a section, hit the PS button to lock onto that section and then have L and R buttons navigate up and down. -Allow the configuring of the L and R buttons when viewing videos to either skip or ff/rew. -Let us use our PSP Gos as advanced remote controls for our PS3s!!! I’d love to be able to use my Go to move around on the XMB and see whats playing on it or manage playlists with it. Could be a cool party mode feature. So, is the PSP Go worth it? Is it a step forward or backwards? I say it’s 2 steps forward, but 1 step back. I personally like the PSP Go but…. 8/10 for new PSP owners. 6.5/10 for current PSP owners. The fact you have to re-buy your previous UMD games and accessories really makes it hard to justify the upgrade. For some of us though (like me), I full well knew what i was getting into when i upgraded (no homebrew, starting over). However for current PSP owners who don’t really need the portability or have large UMD libraries, this device is not for you. For those new to the PSP experience, the PSP Go is a good start. The initial startup cost is still pretty steep for a handheld but if you already have a PS3 and heck even a locationfree tv base, this PSP Go is a nice compliment to such systems. LocationFree TV on it works really well and the always overlooked Remote Play ability of your PS3 and a PSP is nice too!